Makes me think... How about YOU? Seriously, if the defense budget were cut in half all at once and immediately, do you think it would be accompanied by a 50% tax cut or 50% increase in entitlements or even (God forbid) a huge payment towards our debt? That money will line certain pockets whether it's in defense or not. I hear ya, Bre'r Art, but still, that's a piss-poor rationale for what we're doing :-( If we could just retool the military-industrial complex into, say, an infrastructure-industrial complex, we'd be in GREAT shape. Let's go build some BRIDGES! Perhaps the argument could be made that you can still produce and sell armaments to different countries, but you don't need to have all these arms at your disposal. Let's go build some BRIDGES! It makes me think the first image shows the countries we owe the most money to and the second the number of toys not yet paid for and thus not ours. how else do you maintain superpower status? As someone who lives on the wrong side of a bridge that's about to fall over....I'm all for this. The bridge industrial complex FTW! Seriously, though, as someone who has made large chunks of money from defense spending, it does prop up the economy, but so would rebuilding the Magnolia Bridge and fixing the King County Metro funding problems, and a million other projects like those around the country, that would make life better for people in the local communities. Heck, we might even be able to get Bertha digging again. Isn't that what the nukes are for? The Carrier chart left out Cape Cod's Navy. I'm just greatful we have them for defensive measures. I'd hate to see what some Offensive minded countries would do if they had this arsenal or if this defense didn't exist. Defense wins Superbowls. See Seahawks! 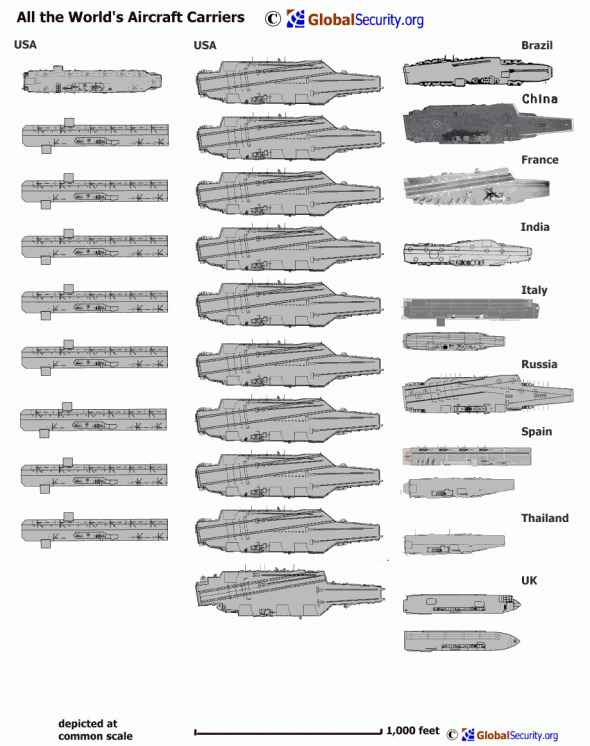 I guess an alternative might be to build people carriers instead of long range aircraft carriers. Um... Some would justifiably argue that's not a theoretical question :-) The only real difference between freedom fighter and terrorist is the side the comment comes from. I'm with Art... special interests have to get returns on their investments in buying politicians and while that's cynical it's also reality - regardless of which brand of politician you might vote for. Maybe they could continue with that in space exploration or airplane design or something that might be more useful to the world - yes I know some spinoff things come from weapons design - but it's a discussion that can never be tested unfortunately. I mean... it's not like we could use that money for education or something actually likely to make a real difference. Looks like that might be the reason we owe China so much money, and also why they will never collect..
We also give more in foreign aid than any other country as well. Where do those numbers in the original graph come from? It's estimated that China actually spends about 2x what it reports on defense. 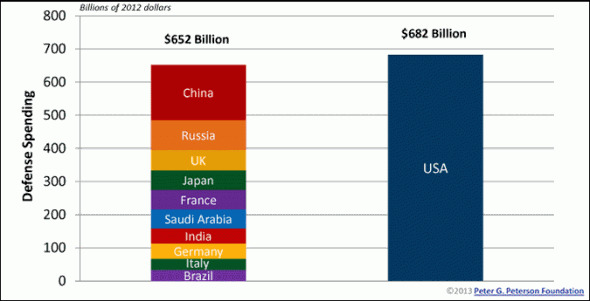 You also need to keep in mind that the US spends far more to get an equivalent item than China. If you look at some simple electronic chips, if you buy one that's made in China, they cost maybe $.55 each. If you price the U.S. made Mil-Spec version of the same chip, you'll find prices about $20. I heard somewhere "If you prepare for war, you'll get war". It's obviously not always true, but I think the chances are greater when one tries to overdo everyone else. So corporate America is ripping-off the taxpayer with overpriced products? I'm shocked! It's not really a matter of how much we spend on defense - I am all for having the absolute strongest defense, but my contention would be that we should have that same level of defense for HALF that cost. One issue is what Spork indicated - we pay a lot more for things than other countries, but I would contend that we pay a LOT MORE than we should. Most of those billions line the pockets of a very select few and another portion is outright waste. I've seen plenty of both first hand and the bureaucrats, politicians and least of all the contractors who benefited clearly had no interest or intention of changing anything. Cynical, but true. How can there ever be any serious cuts or reforms made when the people who would need to initiate and push for those reforms are the ones who benefit directly from the excesses? Hell, if I was receiving lucrative contracts from DoD, I'd be hard pressed not to justify and defend every dime they gave me and it would only be a smart investment to spend a portion of that money influencing (lobbying, etc) the decision makers to continue to grant me those contracts. Honestly, I don't begrudge anyone who is making a good living off of our defense spending - it's a major systemic flaw in our legislative process that amounts to nothing short of overt, unapologetic corruption. Not limited to Defense either, but that IS where the bulk of it seems to go. Not entirely. Much of the difference is in the requirements set up by the military. They will typically specify that it must be manufactured in the US. That costs more. They will also insist on guarantees of expanded operating ranges...perhaps an upper temp limit of 60C vs. 50C for the cheaper version. That costs more. They have their own set of test standards, the "Mil-Spec"...that requires additional testing by the manufacturer and drives up the cost. A "normal" chip might have an annual sales volume of 10,000,000 units and be required to pass testing that is developed by the company itself. The "mil-spec" chip might have an annual volume of 10,000 units and is required to pass a more involved test program developed by the government that requires investment in a lot more specialized equipment. Now the government will insist that those components be used in systems they buy, even if the system could operate with a "consumer grade" component instead of the "mil spec" component. In fact with some kinds of systems, the consumer version will outperform the military version. One example is handheld GPS units. The military issue version was much more expensive, larger, heavier and more difficult to use. Plenty of units went to battle relying on off the shelf Garmin GPS units. Message edited by author 2014-02-27 14:05:55. ... They have their own set of test standards, the "Mil-Spec"...that requires additional testing by the manufacturer and drives up the cost. By 4000%? Does that mean everyone else's military equipment will fail during a heat wave? I didn't say we give the biggest percentage, just that we gave the most, which we did. If you factor in the private philanthropy I think we're pretty generous. Yeah. Working against the government is the fact that they will buy fewer units AND that their requirements for testing often drive significant investment in testing capability, both in terms of time and capital. Message edited by author 2014-02-27 14:23:01. While their labor costs may be cheaper, that would only be a fraction of the overall cost of creating highly customized components in low volume. Proudly hosted by Sargasso Networks. Current Server Time: 04/21/2019 02:36:03 AM EDT.